As a business, do you have an advertising strategy? If you do – when did you last review its success in generating you business? If the answer is ‘a while ago’ or even, ‘I don’t know’ then it probably needs your attention. Does your strategy use the latest data, technology and metrics to make sure it reaches your target demographic? Here are some tips to help you assess your current efforts. Recently I saw a renowned law firm’s advert on tv and it surprised and perplexed my marketing brain that it is still exactly the same advert it has always been. True, in reality this may not be forever but if you think in terms of advertising – it may as well be a lifetime. If you don’t know which advert I’m talking about, here’s a quick word picture: A man has an accident at work or a woman gets rear-ended at some traffic lights and then the advert cuts to the injured person sitting in bed, covered in bandages, plaster casts and neck braces. 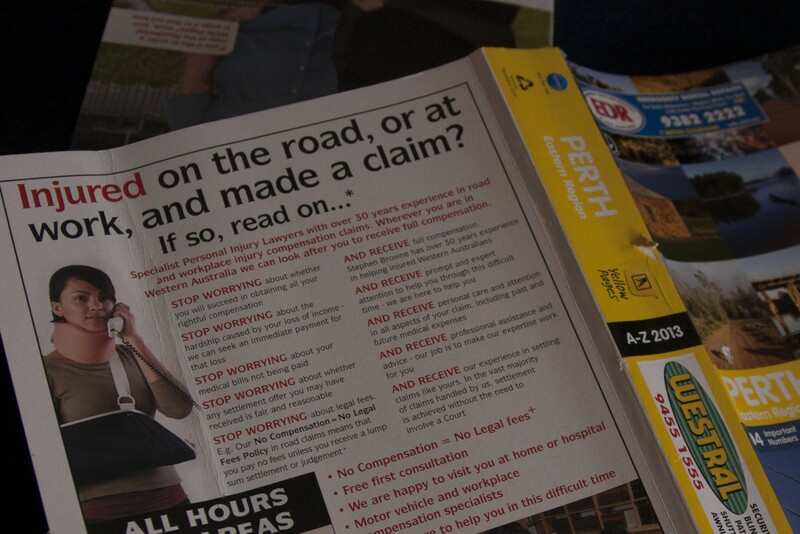 For whatever reason they have a copy of the Yellow Pages handy, just within arm’s reach and the tag line of the advert is “Insert Lawyer Name Here- see us on the back of the Yellow Pages- we’ve been there for years”. Glossing over the convenient narrative of having the Yellow Pages in bed with you when you’re injured I’m just going to ask the obvious – why are they STILL using the Yellow Pages? The only reason I would have the Yellow Pages in bed with me when injured would be to prop up my injured leg! With the ability to google anything these days from your electronic gadget of choice, why would you use an actual directory made of paper? I believe that using the Yellow Pages dates this company’s advertising campaign and to me, signifies that the advert was created when this way of searching for a business was still current. Gone are the days when your paper directory was your bible and you could look up any business – from an architect to a piano tuner. So why do they still use this advert? The simple answer is money. The company would have paid considerable money creating the ad and are now still spending money paying for slots on television. The extended answer is: it’s worked for them in the past – so why change. But how do you know your customers are coming from the Yellow Pages? Digital marketing has the advantage over traditional in that every click, every page view is measurable! Who are your trying to reach with your messages? Where do they like to spend their time? Use research to determine where your target market is most likely to see and absorb your latest product, offer or sale. If your market is Baby Boomers or older, maybe the Yellow Pages isn’t the worst choice, but for anyone else it seems like a throwback to a long-gone era. If having an ad in any form of print media worked for you 10-15 years ago – great but as times change so should your approach. Your clients more than likely have moved to different methods of sourcing information, especially with the never-ending development of apps, search engines and websites. If you are wondering why your advertising return on investment is not as great as you had hoped – maybe it is time to have a closer look at how your potential market would try to find you. But I’m not saying all directories are bad. Bean Hunter (where you can search for decent coffee shops near you) is simple, categorised, local and interactive. Not only can you add pictures of the shop, you can also add images of menu items, show off your latte art and write reviews – it is consumer assessed and feedback is instant. Hotels Combined They have a modern, simple, successful advert on tv that has a simple message – use us for cheap accommodation. They compare prices from different accommodation providers for you in mere moments and save you trawling the internet for deals. They even have a strangely masculine polar bear as their mascot which makes it oddly memorable. Why do these two examples fare better in my opinion? Because they live solely online and this is the way most people look up information these days. Also, Hotels Combined and Bean Hunter (and many others) succeed as “online directories” because they offer MORE than just a list of businesses. They have incentives. It’s like joining a community. The online directories also have the ability for community members to write reviews, add pictures and give so much more information than you could get before! Peer evaluations, though one person’s opinion and always should be taken with a grain of salt, are what makes them better and more informative. Bean hunter/Zomato/etc. are the same – they all rely on user input. This is the next step up. Helping people choose from the list, not just providing one. With the Yellow Pages – a business had to pay to have a small written ad published and you had no further information. Essentially what I’m saying is that it is important to regularly review your advertising strategy. Connecting efficiently with your clients through the most appropriate medium is going to be the key factor in ensuring you are getting maximum ROI. In some cases this could be through an online directory, in others it is ensuring your business is visible on google or social media. The way your potential clients search for your business will have drastically changed in the last 5, 10, 15 years and your advertising strategy should reflect this progression. Either that or stay the same and risk becoming invisible or obsolete! Handy Hint – If you want to stop receiving these pointless books of yellow paper, go to Directory Select to unsubscribe your address and also return old directories.